My blog has recovered now! I have been so busy in my private life that I forgot to update my blog! Half of a year has gone now.... Scary! Anyway, here you go, my cutest new arrivals for June! This time, I have got beautiful jewellery. I didn't intend it, but most of them are black and white (clear). My favourite of this month is a bunch of trifari jewellery! Specially, I collect pearl series. I love Trifari's chic colours of pearls and gold. There are more pearls from not Trifari. I love the pearly bee. Bee is one of my favourite motif at the moment. Speaking of pearls, I have got cool blue pearl necklace, perfect for summer. The opposite colours of pearly white, black! Black is the chicest colour. The middle is from 1930-40s, the right is Deco. One of my favourite this month. The rare star-shaped beads necklace from 1920-30s. It is not glass, so very light! Of course, there are colourful flowers in stock too. These are my favourite too. I love the pansy motif, I've got one for myself too. The left is from 1950s, and the right is from 1960s. This is also my favourite. Unique glass necklace, probably 1970-80s. It would suit simple white or black top, or tribal clothes too. It is not signed, but I guess this is from Steiff (well-known German company of Teddy bears), 1960s. I thought this ash tray fox is very similar to of the glasses I have bought before. Shot glasses are set of 6. Both are from 1950-60s probably. 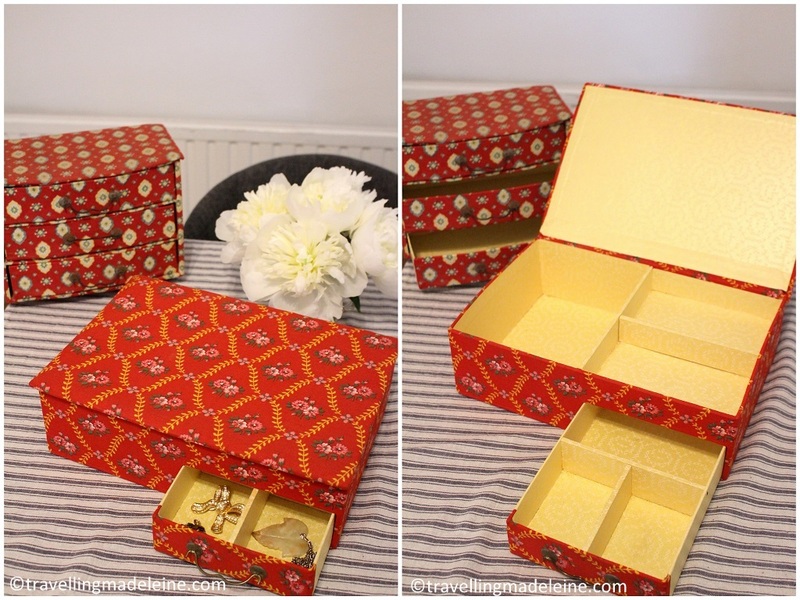 I have got lovely cartonnage boxes. The jewellery box in front is almost new. I am using these for display, but they are for sale. I have already finished of this month's Old Spitalfields, however, I am going to sell in this fair this month. I will bring vintage clothes too! It is in the middle of East London, Dalston! Free entry too! Come and see me there!